Changing climate conditions in Cameroon are thought to be partly to blame for a fungal disease of the staple cocoyam crop. Cocoyam is a plant known by several names. In much of the world it is called taro. Some people know it as elephant ears, while in Nigeria and much of Cameroon it is simply cocoyam. But whatever you call it, it is an important food source, both as a root vegetable and for its big, fleshy leaves. But something has been happening to the cocoyams of Cameroon. A disease, which causes the plants to rot from leaf to tuber emerged in the South West region of the country after the early rains in March 2010, and quickly spread to parts of the North West, West and Littoral regions. 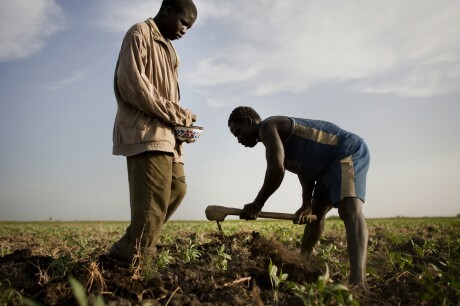 “When I saw my farm, I almost collapsed. My children asked whether this meant that their school had ended. Tears ran down my eyes. They said they would look for a holiday job. I could not answer,” said Ntumeh Angeline Bih, a widow and mother of four children who lives Bafut, one of the areas which was worst affected. The disease, identified as phytophthora colocasiae, and also known as taro leaf blight, was new to Cameroon but was already known in Malaysia and some other south-east Asian countries. Mboh Michael, from the Ministry of Agriculture and Rural Development in the North West region, suspects the disease was a partly a result of changing climatic conditions. The 2010 dry season lasted longer than usual and even when the rains came, they lasted only a few days. Mboh believes the fungus was transferred by the winds in dust clouds during the dry season and deposited on the leaves of the crops. With the return of the rain, the spores found favourable conditions for their development. Mboh Michael and specialists Dr. Ngoko Zachée, a plant pathologist, Dr. Njuallem Dominic, a plant breeder, and Atanga Jacob, an expert on nematode worms, visited the North West region to assess the damage, determine the causes of the disease and propose solutions. The scientists linked the dust which settled on the plants to the disease, though without clear evidence as to the exact relationship between the two. Atanga Jacob says that if rains had fallen, they would have washed away the dust: “We are putting forward the hypothesis that the dust blown to Cameroon by the wind brought the disease, because we had never had the disease before,” he said. Most of the crops in the affected areas were completely destroyed. Dr Ngoko says three pathogens were involved, but the main problem was the colocasia blight. “The causal agent is a fungus that destroys both the leaves and the stems of the cocoyam,” he said. The disease starts as a small dark spot on one of the cocoyam’s leaves, which then spreads to all the mature leaves, causing them to rot. The stem and the tuber follow. The farmers in these parts of the country practice mixed cropping, but no other crop was affected. Cocoyams are second only to maize as the most widely eaten foodstuff in the affected areas. They can be pounded into achu, a traditional dish among some tribes of the North West region, now widely consumed throughout Cameroon. They can also be roasted, cooked in their skin, or peeled, boiled and eaten with a wide variety of sauces. Even the leaves are used to prepare soup and another dish called ekwang. was no seed this season. The few farmers who had retained seed grew the crop for their own consumption. The little that makes its way to market is now very expensive. Restaurants in cities like Douala, Yaounde and Bamenda, which specialise in achu, were badly affected. “What we use now to prepare achu is what should have been used as seed. I am afraid we may not even have seed for the next farming season, and that means no achu,” said Regina Shiri, a restaurant owner in Bamenda. Maize production in Cameroon has never met demand in the country and plantains, another staple food, are usually very expensive. Preventing or treating future damage to cocoyam crops is essential in a country in which rising food prices have caused unrest and continue to threaten food security. I’m Abaajeh Rita, a Cameroonin,a horticulturist in South Africa and busy with a research of bat guano on fungi to test for any fungicidal property in bat guano. If the ministry can permit, i would like to do a research on this colocasia blight with some of the chemicals used to control P. infestans in potato or work with plant genetist to introduce or transfer resistance genes from other species that are not afected. Also, as concerns the lack of seeds, we can produce millions of disease free seed invitro and distribute to farmers. Thanks for your contributions towards solving this problem. In the Western Highland, taro farms have disappeared completely. My visits in some areas of the region showed that these farms are empty, like if they were leaving them for fallow. The eating habits are being shifted to expensive commodities such as rice and maize; famine is therefore threatening children and elderly people. It is becoming more serious as Cocoyam (Xanthosomas spp) is now also being attacked. We really need to act now and rapidly. Please Jackson, your support is well come. Scientists in Cameroon link changing weather patterns to a fungal disease of the staple cocoyam crop.